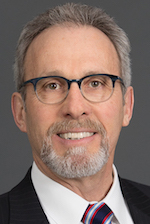 Bruce is the Chief Physician Executive for Blue Cross Blue Shield of Massachusetts, the largest private health plan in Massachusetts and one of the largest independent, not-for-profit Blue Cross Blue Shield plans in the country. The company has more than $7 billion in revenue, serves nearly 3 million members, and is rated among the nation’s best health plans for overall member satisfaction and quality. He currently serves on the boards of the Blue Cross Blue Shield Foundation, the Network for Excellence in Healthcare Innovation and the Greater Boston Food Bank. Bruce earned his undergraduate degree at Rensselaer Polytechnic Institute and his medical degree at Albany Medical College. He is a board-certified family physician who completed his residency training at Duke University. He also received an MBA in health sector management from Duke University's Fuqua School of Business.